Is “Islamophobia” a rational concept? Is it “the new racism”? ‘Islamophobia is the new racism’ is now a seeming truism, or so Baroness Warsi and many others would have us believe. She claims that Islamophobia has ‘passed the dinner table test’ and that anti-Muslim prejudice is now normal and uncontroversial in respectable society. Warsi’s views are echoed by many British Muslims, who claim to experience such prejudice daily. It is important to distinguish between criticism of Islam and criticism of Muslims (either individually or collectively). Islam competes with the Roman Catholic Church as the world’s most objectionable religious influence. (If I were given the choice of eliminating the influence of Islam or eliminating the influence of the Roman Catholic Church, whichever I chose I would feel guilty afterward for not choosing the other). Islam “in its natural state” is currently at best medieval, (for example, its typical attitude towards science), and at worst intolerant and barbaric, (for example, various aspects of Sharia Law including attitude towards women, intolerance towards other religions, and immature and exaggerated reactions to criticism). This isn’t a “Clash of Civilisations” – Islam “in its natural state” isn’t yet civilised. This is a “Clash of Eras” – the 1st millennium CE (Islam) versus the 3rd millennium CE (“the West”). Islam has not undergone its own “Enlightenment”, and in general appears unable to do so. Christianity has had hundreds of years to adapt itself to modernity while Islam has had modernity thrust upon it. But … Individual Muslims may be far more enlightened than Islam itself, of course! This is especially true where they are integrated minorities in non-Islamic states, and are free to cherry-pick the less medieval, intolerant and barbaric bits. Like many a clever coining, the term ‘Islamophobia’ remains undefined and its existence uncontested. The first recorded use dates back to 1990 in the American magazine Insight, although its etymology can be tracked to the mid 1920s. Since then after being a sociological concept largely restricted to Britain its use increased exponentially when it was declared a new form of global racism by the UN in 2001. In 1997 the Runnymede Trust provided a “diagnostic” for Islamophobia, in the form of a table that I have spread out below. According to the Runnymede Trust, “phobic dread of Islam is the recurring characteristic of closed views. Legitimate disagreement and criticism, as also appreciation and respect, are aspects of open views”. The obvious flaw in this diagnosis is that it assumes that the open views are correct! It would be more accurate simply to label the “closed” and “open” views: “Views unacceptable to most Muslims” and “Views acceptable to most Muslims” respectively. The “Commentary” text is mine. It is intended to reveal the unlikelihood that this table diagnoses what it purports to diagnose. Closed views of Islam: Islam seen as a single monolithic bloc, static and unresponsive to new realities. Open views of Islam: Islam seen as diverse and progressive, with internal differences, debates and development. Islam is certainly diverse, and has internal differences, for example between Sunnis and Shias, that have often led to armed conflict. The Wahhabi “difference and development” led to the Saudi Arabia type of fundamentalism. In other words, the “open” view here can be consistent with the “closed” views of 3 and 4 below. (Note – some Muslims themselves stress the unitary nature of Islamic belief and practice!) Islam’s responsiveness to new realities often appears to be reluctant, requiring close proximity to western influences. Examples of proximity include Muslim minorities in western democracies, and Turkey’s desire to join the European Union. Closed views of Islam: Islam seen as separate and other – (a) not having any aims or values in common with other cultures (b) not affected by them (c) not influencing them. Open views of Islam: Islam seen as interdependent with other faiths and cultures – (a) having certain shared values and aims (b) affected by them (c) enriching them. Islam inevitably shares values where these are dictated by human nature. And it evolved in the 7th Century from other influences, including Christianity and local culture. But it is not clear what other aims and values it now consistently shares. For example, Islam is incompatible with universal human rights, which is a major aim/value in other cultures. Value-sharing by Islam often appears to require close proximity to western influences. (See 1 above). Closed views of Islam: Islam seen as inferior to the West – barbaric, irrational, primitive, sexist. Open views of Islam: Islam seen as distinctively different, but not deficient, and as equally worthy of respect. A starting point for such a discussion is identification of whether universal human rights, sexual equality, science, technology, and democracy, are considered to be progress. If they are, then Islam will be evaluated as primitive and sexist, because to varying degrees it displays antipathy towards these. Islam’s contributions to western civilisation were typically made at least 500 years ago, and the Islamic world has justly been described as a “science desert”. Judged by its own values, no doubt Islam will be seen as worthy of respect. But why should non-Muslims use that criteria, when they wouldn’t use those values to judge their own culture? Closed views of Islam: Islam seen as violent, aggressive, threatening, supportive of terrorism, engaged in ‘a clash of civilisations’. Open views of Islam: Islam seen as an actual or potential partner in joint cooperative enterprises and in the solution of shared problems. It appears to be deliberate on the part of many terrorists that their acts of murder and mutilation should be associated with Islam. They appear to see this linkage as a political tool. “Islamic terrorism” appears to be a “brand” developed by some influential Muslims. Similarly, international Muslim responses in the Salman Rushdie affair and the Mohammed cartoon affair appear to have been orchestrated by some Muslims to generate a clash with the non-Muslim world. Some Muslims appear to want people to adopt this “closed” view! The answer lies in 1 above. Islam is diverse, with internal differences, and is not a monolithic bloc. It is as wrong to generalise it as “peaceful” as to generalise it as “supportive of terrorism”. It has multiple faces, and in part both of these views are true. (See also 5 below). Closed views of Islam: Islam seen as a political ideology, used for political or military advantage. Open views of Islam: Islam seen as a genuine religious faith, practised sincerely by its adherents. Islam is both of these, practised in different proportions by different people in different societies. Attitudes towards human rights, family law and sexual equality, financial transactions, foreign relations, criminal justice, science, and democracy, are topics that might appear in a typical political manifesto. (They can be seen in UK party manifestos since WW2). Attitudes towards supernatural beings such as a god and angels are topics that might appear in a typical religion. Many, perhaps virtually all, of the negatives attitudes (other than disguised racism) towards Islam by non-Muslims are in response to the political manifesto, not to the religion. Modern western societies are typically tolerant towards genuine religions. They are not so tolerant towards “alien” political manifestos, because while religion can be a personal matter without significant impact on others, the political aspects typically affect non-Muslims. At this point, non-Muslims draw the line, and often resist. Closed views of Islam: Criticisms made by Islam of ‘the West’ rejected out of hand. Open views of Islam: Criticisms of ‘the West’ and other cultures are considered and debated. Given the degree to which many non-Muslims themselves criticise aspects of western values, it is probably rare that such criticisms are rejected out of hand! “The West”, like Islam (1 above), is diverse, not monolithic, and should be seen as such by Muslims, and not be criticised en masse. But Muslims have to tolerate rejection of their criticisms by individual western democratic cultures, in spite of any antipathy by Muslims towards democracy itself. Non-Muslims often have their own criticisms of “the West” rejected! That is life in western democracies. Closed views of Islam: Hostility towards Islam used to justify discriminatory practices towards Muslims and exclusion of Muslims from mainstream society. Open views of Islam: Debates and disagreements with Islam do not diminish efforts to combat discrimination and exclusion. Discrimination of people on factors that are irrelevant to the situation is unacceptable. But exclusion of Muslims from mainstream society is sometimes self-inflicted. When Muslims criticise mainstream society (6 above) they may also tend to exclude themselves from it. Whether they are being excluded from society can only be judged in cases where Muslims have made the same efforts as others to be included in mainstream society. Closed views of Islam: Anti-Muslim hostility accepted as natural and ‘normal’. 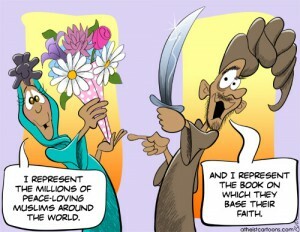 Open views of Islam: Critical views of Islam are themselves subjected to critique, lest they be inaccurate and unfair. These views are not in the same dimension! One is about anti-Muslim hostility, in other words hostility towards people, which is unacceptable. The other is about criticism of Islam, in other words criticism of a religion, and that can be healthy and should be encouraged. Muslims themselves, especially Muslim women who are probably more than half of all Muslims, may benefit from criticism and reform of Islam. Much criticism of Islam is prompted by sympathy towards the Muslims who currently suffer from the consequences of Islam. Perhaps some Muslims would say “mind your own business”. But people who believe in universal human rights typically believe this is their business. However, ‘Islamophobia’ expresses not a primitive fear of Muslims and Islam but several deeper anxieties that dominate British and Western political culture. The first of these is a fear of conviction. Contemporary ‘post-modern’ morality encourages us to reject certainty in ourselves and others. We fear to confidently state our own convictions in case we are accused of bigotry, and we are anxious about others expressing their beliefs in case they are forced upon us. We may repeat the mantra that all perspectives and philosophies are equal, including beliefs held by others, but we shy away from a close examination of these beliefs for fear of losing the moral high ground of being non-judgemental. We need to identify a credible framework for analysis, then not be afraid of examining beliefs and ideologies against that framework. My framework is described by Dimensions of enlightenment. Islam comes out very badly. This fear of strong ideas is connected with another fear. Fear of free speech. There is no doubt that there is a deep-rooted ‘phobia’ in our society, but it is not of Islam. The fear that has gripped people is a fear of open debate and free speech. Across the spectrum, politicians may advocate for liberty and freedom of speech, but with caveats and ever stricter limits. Both sides of the Islamophobia debate have argued for curbs on freedom of expression and free speech. The free speech of Muslim ‘extremists’ is curtailed in the interest of community cohesion. And the freedom to criticise Muslim fundamentalists or even Islam is chilled by charges of Islamophobia. I believe that one of the reasons for the use of the word Islamophobia is precisely to thwart legitimate and warranted criticism of Islam. Therefore we must have the courage not to be afraid of accusations of Islamophobia. Why should we? It is based on shoddy analysis! Fundamental to the fear of free speech is the fear of giving offence. We live in a culture where giving offence is deemed worse than grievous bodily harm. Some even argue that ‘hate speech’ itself harms the very being of those at whom it is directed. This doesn’t just betray the fear of argument and debate, but also the diminished view of individuals and groups particularly Muslims as not being capable of rational argument. This is one area where so-called “new atheism” is influential. It is gradually making criticism of religion in general acceptable. In a world of 7 billion people and global communications, where 1000s of gods are worshiped and 1000s of religions are practiced, it it probably impossible to say anything important that someone won’t be offended by! We need to recognise that typically people feel offended for one of 2 reasons (apart from direct personal attack): because they have chosen to be offended, or because they have been indoctrinated to be offended. People can make different choices, both for themselves and for their children. I hope that if warranted criticism of religion is continuous and relentless, religious people will start to make the right choices, and stop trying to protect their beliefs from criticism. I want to be able to criticise religious doctrines, but I don’t particularly want people be feel offended. I want them to be able to respond in a more rational and constructive manner to such criticism. Typical use of the word “Islamophobia” is based on sloppy analysis or a desire to thwart legitimate criticism. “True” Islamophobia (fear of Islam, based on cited problems with Islam) doesn’t resemble racism. That doesn’t mean there isn’t racism directed at Muslims, but it is always necessary to distinguish between attacks on Islam and attacks on Muslims. Consider Koran Sura 4 verse 34: wife beating. This warrants criticism for as long as it exists within Islam. But it would be wrong to convert this to hatred of Muslims. Indeed, it makes more sense to have sympathy towards half of Muslims – women. As is often the case, the people who practice a religion are sometimes the victims of its nasty bits. And husbands have the right to be treated as innocent until judged guilty based on individual evidence. (I have not seen evidence that British Muslims beat their wives more frequently than British non-Muslims, and anyway that would not indict any specific person). Should modern Muslims re-brand Islam?